This is so easy it isn’t even a recipe! My friend and inspiration Allison from Organically Yours in Northport makes this salad with apple cider vinegar. I like to make it with red wine vinegar. You choose! All you need is a fresh cucumber and you are all set! Whisk together the olive oil and vinegar. Add dill and salt. I can’t give measurements for these; just add them to taste and adjust. 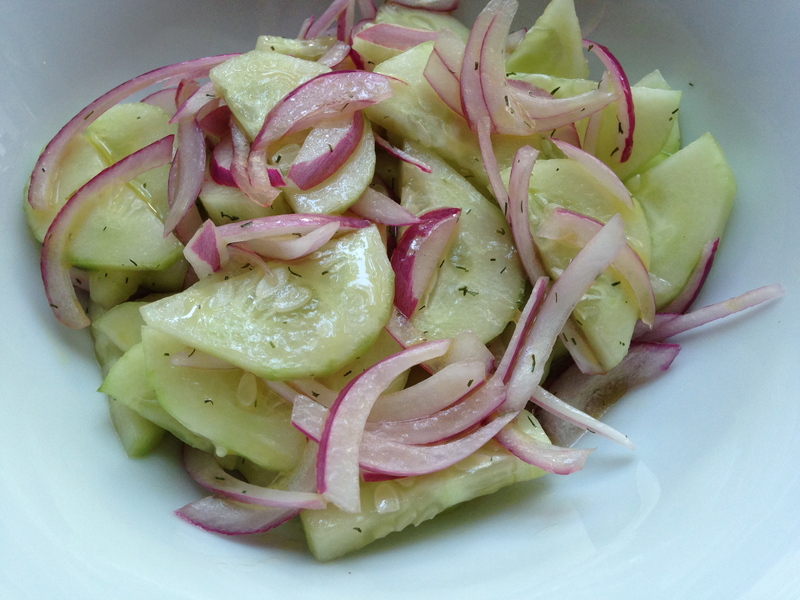 Slice the cucumber and onions and add them into the bowl with the dressing. Stir gently. Let it sit for a few minutes to allow the cucumbers to soak up the dressing and then eat. Enjoy! That looks very refreshing… and easy to prepare, yay!